If someone looked under the hood of your business, what would they find? If you hired someone new today, would they be able to easily access the information they need to get the job done? Or would they be sifting through a clutter of files, or, worse yet, is everything they need to know stored only inside your brain? Our guest today is Tiago Forte, founder of Forte Labs, a company that specializes in productivity. Tiago talks about the importance of building and maintaining a solid knowledge management system for your business, otherwise known as a “second brain.” Having a second brain not only makes it easier to onboard new employees as your business scales, but it can also help increase your overall organization and productivity. Andrew and I learned a ton from this episode and we hope you enjoy it! 5:11 The goal of Forte Labs: Finding transformational paradigm shifts in productivity. 7:10 The impact of an international upbringing on Tiago’s work and mindset. 9:17 Tiago’s big realization about the best way to help people. 10:54 Defining “design thinking” and why it’s fundamental to entrepreneurship. 13:47 The difference between productivity, efficiency, and effectiveness. 15:53 Being organized as a state of being and the method Tiago created to help people get organized. 19:32 The benefit of micro-projects. 23:02 How micro projects help you elevate your perspective. 26:48 The importance of having a knowledge management system as your business scales. 29:37 Building your knowledge management system, i.e., your second brain. 35:33 How to increase your productivity without working faster or working more efficiently. 37:38 Linking your communication apps and your productivity apps. 41:27 One easy thing you can implement right now that will increase your productivity. Andrew Foxwell: And I'm Andrew Foxwell. World Traveler Austin Brawner back on the podcast. Austin Brawner: Back on the podcast from Bangkok. Had a great trip out there. I was at this Dynamite Circle conference, giving a presentation and spending about four or five days hanging out with some really fascinating entrepreneurs and eating as much Thai food and Indian food as I possibly could. Andrew Foxwell: This kind of describes us. You go to Bangkok. I go to Nashville, Tennessee and to two National Parks. I just feel like, neither one is less cool. I just feel like if you're wondering, you know the guy with the high top hat and the sweater, that's me. And Austin is being cool being an entrepreneur internationally. This just describes who we are. Austin Brawner: I don't even know what a high top hat is. Andrew Foxwell: One of those foam trucker hats that's like really high and got mesh in the back. You know? Old school? Austin Brawner: Oh yeah yeah yeah. For sure. Now I get it. I get it. No, I mean. We've been both on the move man. So it's always fun to catch up here. It's one of those, today we have one of those episodes that we've been both kind of looking for the right person to bring on. Last year, we brought on Sebastian Marshall and we talked a little bit about productivity. Really fascinating episode. And we've been thinking to ourselves, we've been doing a lot of these tactical episodes about Facebook, email, let's bring on someone to talk a little bit more about the inner game, the mental game of productivity and so we reached out to a guy named Tiago Forte who came on and just delivered a fantastic episode based on kind of paradigm-shifting productivity. Andrew Foxwell: Yeah, it goes through kind of the way to go tracking your work and the way to work with your team and the way to keep notes better and the way to make sure that you're kind of processing the things that are on your mind in terms of knowledge versus action. So I definitely enjoy the conversation, so let's go ahead and welcome him onto the show. Tiago Forte: Thank you. Thank you so much. Really glad to be here. Austin Brawner: We're excited to chat as well. You know, we've been kind of following along some of the work that you've done for a while. You know, at the beginning actually, about a month and a half ago, we kind of reached out to our audience and we're like, "What would you like to learn about?" And a lot of the people mentioned they are interested and we did a productivity episode last year and they are like, go find somebody and bring somebody on who is kind of an expert in productivity and so that's kind of why we reached out to you. We've given our guests a little bit of background on you, but why don't you take about a minute or so and tell us a little bit about yourself personally and give us an overview of what you do. Tiago Forte: Of course. Happy to. My company is called Forte Labs. Forte Labs has been around for about five years. And what I do is I produce educational content on all aspect of productivity and my goal is really, you know, I'm not interested in so much tips and tricks, although those can be useful sometimes. I am looking for like transformational paradigm shifts. So what are the fundamental mental models, mindsets, attitudes, approaches, identities, that allows someone to just massively increase their own effectiveness by even orders of magnitude. So that mission, that very admittedly ambitious mission, sends me on these kind of adventures through really diverse fields. I tend to research and bring in ideas from like manufacturing, like sports, like the military. Past history. Just a diverse range of fields, then I pull the best kind of principles and ideas from these fields to teach modern knowledge workers, really people deploying their knowledge and their skills as their primary assets to help them become more effective in modern knowledge work. So, those products and services include ... I have online courses which is kind of my main thing, three different online courses that I teach. I also have e-books. I have a membership-based subscription blog, then I sometimes do trainings and workshops for schools or government agencies or companies so a pretty wide variety of different types of media with transforming people's productivity as the unifying theme. Austin Brawner: Now you've had a pretty interesting background. I was listening to another interview with you where you talked a little bit about your international background and where you've lived and worked. Why don't you give us a little run down of kind of ... I know you were in Ukraine for a while. The Peace Corps and now you're in Mexico City right now. Tell us a little bit about your international background and how that's had an impact on maybe some of the work that you do. Tiago Forte: Yeah, I think it's just had an unbelievable impact. I mean it really goes way further back then you even ... then the experiences that you mentioned, because I'm a first generation American. So, my mother was born in San Paulo, Brazil. My dad was born in Manila, Philippines. So really, I mean I think I took my first flight when I was just a few months old. Whatever the advised health limit is for infants. And I feel like the inside of a plane was my playpen. I think the impact that's had, so going back and forth to Brazil. To the Philippines growing up. And then like you said later taking trips to Mexico, the Ukraine and the Peace Corps, Brazil in college. I think it gave me an ability to really bridge cultures. Because I always had to do that. I always had to do that to survive. From one language to the other, from one culture to another. From one way of thinking and acting to another. It's like, I spend my life building bridges and that's kind of what I do today. I'll research something like let's say the theory of constraints, which is this very interesting, like toolkit of different principles that comes from manufacturing, like factories, that I've done some work on applying to digital knowledge work. Like that's a bridging. You have to take this mindset of like factories and physical products and the supply lines and supply chains and efficiency and then apply it to more creative unpredictable knowledge work. So I'd say that's been on pretty deep influence. And the other is just that most of my career has been actually in, it's been in nonprofits and philanthropy and development work. There's the Peace Corps which is a couple years. Before that I was in microfinance. I lived in Columbia for six months working for a microfinance startup. And so really I'd say 70, 60, 70% of my career was trying to do good in some way. But then at some point, actually in the Peace Corps I just realized, that people don't need handouts or at least not everyone needs handouts primarily. They need skills. And they need knowledge. They need to be more effective. That's the fundamental zero to one breakthrough. So I left the Peace Corps, came to San Francisco and started Forte Labs with the goal of helping people become more effective using media which is kind of more accessible to more kinds of people rather than corporate trainings and conferences which can be expensive. So those are, I'd say, a couple strong influences. Andrew Foxwell: Very, very interesting. I mean the way that you go and approach a lot of your work has foundational aspects clearly in design thinking and you also have a methodology that you utilize that corresponds to design thinking, known as the PARA Method. Can you kind of talk about what is design thinking actually? How do you define that? And how does it relate to the work that you do with your methodology? Tiago Forte: Yes. Great question. So for me, design thinking is way, way more than ... I mean for those who don't know it's basically a way of working. It's a way of completing kind of ambiguous products in which you're creating something that was developed, kind of jointly between the innovation consulting firm IDO and the D School which is the design school at Stanford. It's since gone on, it's probably the most influential design method of the last few decades. It's been around the world. Practically everyone has been influenced by it in some way who is in the design space. But for me, I'm interested in the specific method but there is a much bigger kind of consequence, sorry significance, for me which is just the idea that anything can be designed. And, anything can be redesigned. The reason that's so fundamental to entrepreneurs especially is as entrepreneurs, we're coming along and we're not just building things and watching websites. We're fundamentally kind of reshaping reality. And I know that probably sounds very deep but it's like for someone to really buy your product or your service, for you to build a business, it's like you have to change reality in some way. You have to change either something physical, like how people use products to how they behave to how they think. I mean I think that's a very profound thing that entrepreneurs do. So design thinking just has you look at everything you know. The design of a plug. Why is a plug designed the way it is? Why does it have three prongs or sometimes two? Why is it flat? Why is it at that height on the wall? Why is it that size and shape? That color. We're not used to thinking this way. We're used to kind of just looking around and taking everything for granted. And I think as entrepreneurship becomes less like a job title and more like a universal skill, that everyone has to have to some extent, that ability to just see. It's like a basic perception of the world around you and just wondering why it is the way it is, is going to be absolutely key to just succeeding in the world. Austin Brawner: So you mentioned entrepreneurship as a universal skill, right? It's something that you'll have to kind of work on and improve on. I also think that combined with that effectiveness, being effective and being productive are also universal skills. What are some of the biggest mistakes that you see people making when it comes to being more productive and more effective? And also maybe within that if you see those things as being different? How would you define the difference between those two things as well? Tiago Forte: Between being productive and being effective? Tiago Forte: Yeah, you know it's interesting. I use this word productivity which definitely has some controversial connotations. And my definition of productivity is really broad and simple which is, it's just to create value in the world as efficiently and effectively as possible. So the reason I like efficiently and effectively is you have to be efficient, right? You have to actually get it done. You have to like drive to the end. You have to create something and put it into the world. But it also has to be effective, right? It has to have quality. It has to be the right thing. It has to be successful. It has to work. So I kind of see this, it's like this triangle between productivity, efficiency, and effectiveness. All kind of very closely related, but to answer your question about mistakes people make, I mean this is ... let's see. Where to start? My basic approach is that I mean I have this book, Design Your Work, which is a compilation of my essays and articles from my blog. And it's called, kind of related to the design thinking thing, it's called Design Your Work. And the reason it's called Design Your Work is work especially is somewhere where we take things for granted. I'm trying to think of a more tangible example here. One is, be more organized. Right? So this is actually my main focus these days. I have an online course and soon a book called Building a Second Brain. And people have this idea around getting organized. It's like this thing they all know they should do. And never quite get around to. Right? Like one day I'll get organized. This weekend when I have more time. Next week when things aren't as busy. Next month when the project finishes, right? But that time just, it never tends to come. So what I have been trying to do with Building a Second Brain is having people be organized as a kind of a, kind of as a state of being. As a mindset, instead of kind of thinking that they are going to take this three-day marathon and get organized some day. And the way I have them do that is, one of you mentioned the PARA Method earlier. So let's get really specific. This is basically an organizing methodology that I created after many years of trial and error on myself, on clients, on customers. And it basically says, you can organize everything, everything in your world in just one of four categories. Okay. And I mean anything. So the four categories are projects, areas, resources, and archives. And so projects are projects. Right? Things you are working on. Short-term outcomes that you're working towards. Areas are things that you're responsible for. You know like financial reporting or product development or hiring. One of the hats that you wear in your job or in your life. Resources are just things that are useful or interesting. They can be like topics you're interested in learning about. Assets like stock photos. Things you learn from books and then archives is just everything else. Everything that was in the previous categories that is no longer active. Then if you get the first letters of each of those, they equal P-A-R-A which we pronounce PARA. What I have people do is just every time you have a file, like a word document and notes you wrote down, a video file, a PDF, a design file, anything. Instead of dumping it in your downloads folder or on your desktop or your documents folder which is where people tend to dump these things and those places just become a morass of just very random files. Just dump it into one of these four categories. Projects, areas, resources, and archives. It's a super simple decision, right? One out of four things that you have to choose from. And over time, you'll have actually a pretty darn good organizational system. I mean those four categories are more organizing than most people do with their files. And you kind of know where to find things, right? If it's related to a project, it's in projects. It's more related to responsibility, you have arrogance. If it's neither of those, it's probably resources. Then archives is just like all this stuff that you've done, completed or are no longer interested in which you can kind of just sweep into this big hidden archive and don't have to be distracted by it, day to day. Andrew Foxwell: I like the PARA methodology. I've heard you talk about it several times and I know that's what you're working on a book on. From that projects one, that's where obviously most of the actionable data or actionable things are coming from, right? That's your projects. That's what you're going to be doing. And, in your book chapters that you're working on is talking about, making a project list and then talking about micro projects and perspective which I thought was interesting. I like what a lot of people, the reason I asked this question is, I want you to talk about that because or I'd love you to because those of us who are ... ecommerce business owners out here, like there are a billion things they could be doing. And like a lot of them are doing shipping and doing their own marketing and doing everything the two of them or the four of them or the one of them. So how do you go from putting things into that bucket to making the project list and then taking micro projects and kind of working them in with perspective? Tiago Forte: Yes. Okay. Great question. This is another kind of pretty inherently valuable thing people can do is ... so micro projects is just the idea that projects benefit from being small. Right? This is not a new idea at all. It's really small batch sizes which is an idea that has revolutionized manufacturing and software development and healthcare. It's like, has a really really good track record, this idea. But the idea with micro projects is instead of having, I know as entrepreneurs we're ambitious so we take on these big things like relaunch a new website. Right? And I don't know about you, but I've had many times in my life where relaunched new website was an all-encompassing many months long project that just kind of seemed to go on and on and on, because as soon as you start making the website you realize oh first I have to do this. Oh first I have to figure that out. Or first I have to plan that. Tiago Forte: To me, launching a website or creating a website is a massive project especially if you're in ecommerce where it actually has to perform a function. So what I tell people and I see this when I work with them, one-on-one with coaching, is if you have a mega project, one of these mega projects that takes months and months and months. You're going to ... there's a lot of kind of negative impacts, right? One is you don't have accountability, right, to your customers, to your business partners, your investors. Even yourself. Because you know month after month. Well what are you working on? Oh new website. Month passes. What are you working on? Oh the new website. Oh the new website. It's like no one really has visibility into the project including you. So it just becomes this long-suffering just thing that goes on forever. There is another problem which is it's hard to kind of pivot, right? If you have six months you're working on a website. 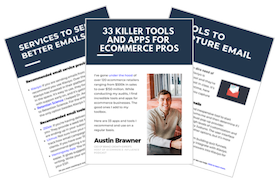 Well in six months the whole landscape of your niche, your ecommerce niche could change. Right? In a few months, it could be the website you need to be creating could be completely different. So what I have people do in my productivity coaching is break those things down. What are the small little pieces? Maybe the first piece is just like a one-page brief describing what the website is, what it's trying to accomplish, what will be the main metrics, what's the timeline, the budget? One page. Right? That's a project. That could take a week. Andrew Foxwell: Right. Right. Just defining it. Tiago Forte: Yeah, definition. I mean project definition is one of the biggest and most influential parts of the project. So I say treat that as a micro project within itself. What that does is, you know, gives you the steady pace of project completions. If you're completing a project every one or two weeks, which is what I recommend, that may seem like semantic. Like oh I'm doing the same thing. I'm just calling it something small, but that's not how human motivation works. Human motivation works with these payoffs right. We need the reward at the end of the effort to then reinforce that we're on the right track. So coming back to your question about perspective, what that actually gives you, and this was kind of a surprise to me, seeing this with people is as they start to complete more and more projects, they start to sort of elevate their perspective. Okay. And what I mean by that is, if you have this like one mega project that takes six months, you kind of have no perspective. Like you are kind of just in the weeds day after day, week after week. You're kind of just never pulling your head up above the clouds to see like, what am I doing? What's the big picture? And that is super risky when you're running an online business. Right? Like running an online business, everything changes so fast, you have to be looking around. You have to be kind of maintaining your sense of what's important and what matters. So kind of unexpectedly once you have micro projects and you're just constantly completing them, you're able to not be attached to one project as the one thing that's going to save you. And say you can kind of step back and look at a portfolio of different projects that you're managing. Maybe as many as 10 or 20 or 30 and then see how they all fit together. Oh okay. Some are more risky, some are more conservative. Some are about building products. Some are about maintaining products. Some are long term. Some are short term. It's like basically you're becoming a project portfolio manager instead of like just a single project manager fixated on one thing. I don't know if that helps but that's kind of what I've seen in my work with people. Austin Brawner: Now I've seen exactly, exactly the same thing and Andrew and I have talked about this quite a bit on this podcast about just redesigning workflow and using like a Scrum methodology where you'll be resetting projects every two weeks or a week and a half. Whatever you decide and how much of an impact that's had on my business and also clients that I work with. So I definitely agree around breaking things down into smaller projects. I really like the idea of focusing on a one page brief and defining projects. Because there are so many benefits that come with actually putting in the time. If you put in one week to define what a project's success will look like there are so many benefits that come from your team. Right? Like the downstream effects of that time you put in are tremendous. One of the things that I ... sometimes I feel people will struggle with or I get this question a lot with some of the clients I work with. It's an entrepreneur. I'm working with an entrepreneur who is very personally productive. They feel comfortable, starting out the business being kind of the doer. And being the person who is able to just put their head down, like you mentioned really, and not look up. Focus on a project and get it done. But as they continue to grow their business, they've gotten more team members and they've got a larger staff they are working with. One of the questions I have for you is how do you think that personal productivity interacts with managing a team? Tiago Forte: Yeah. That's a great question and honestly one I'm trying to figure out for myself at the moment. I mean I'm a small business. I have a few people on my team and what I think I will say to that, it's not something I have years of experience in. It's really just been the past couple of years. But I will say that having, so having a knowledge management system. This is really what my work is focused on. You know like a centralized repository of knowledge in your company is a game changer. It's huge. And this is usually something that large companies think about. Knowledge capture. We're going to have this knowledge platform. Smaller companies, you're just usually, you just call across the office when you need to know something. Or you get all sloppy and you go, "who knows this?" But I think there can be huge benefit to investing in that very, very early on. I started obviously as a solo printer, storing what I know. And what I mean by that is little snippets. It's not like okay, open up this Google doc and write down everything you know. It's like little snippets. How do I fix the WordPress plug in that I always have to update? How do I refund a customer using PayPal? How do I check the Google Analytics and poll, say, three metrics? They are almost like micro skills, that don't take any special skill really. It's just like a mini tutorial. If you take the time to write down a little checklist on how to do that, or record a little screen share, or make a little video of how to do it, that can be something that over time becomes this shared knowledge base for your team. What I found by having that is it makes much, much easier to onboard people. You know. That can be a really huge expense for small companies, is waiting potentially for weeks or months for somebody to reach full productivity, for them to have to go through the process of asking every time they need something until finally they know where everything is? You can accelerate that quite a bit if you have ... and this can take different forms. It could be everything from a Google Drive folder to a notes app which is what I recommend. Note like Evernote or Microsoft One Note or Notion or Bear are a few examples. I'd say for your audience, just start collecting things. Little snippets of knowledge that you have as an entrepreneur. Those are going to be something that you can share with team members, who then will be able to add their own little snippets of knowledge. And over time really build something that is kind of the sum total of what you've learned as an entrepreneur and as a business which, as an online business, is really all you have. All we really have is our knowledge at the end of the day. It's a little bit of code and some knowledge. That's something I say is a really useful thing to have in growing a team. 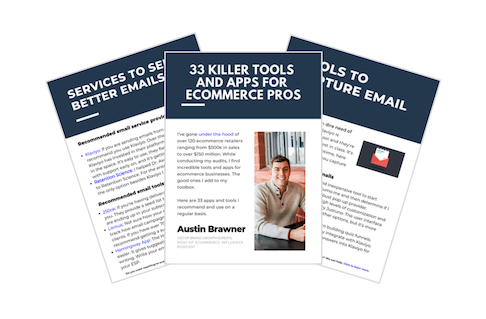 Austin Brawner: So going back to that knowledge management system, because I think that's a really important point and it's something that ... I had the conversation earlier this week with one of my clients who is in that same boat. They hire ... business has been growing tremendously fast. They hired about six people over the last six months and most of his time right now, he said is spent trying to transfer knowledge from him to his team. And he is struggling. He is not able to ... the organization is not there. The digital clutter is out of control and he didn't spend the time organizing those snippets for his team to be able to dive into and kind of self-educate. So for someone who is in a position where they haven't really started to organize their knowledge, I know you mentioned earlier the PARA Method. Projects, areas, resources, archives. How does it actually translate or if you could give a kind of more in-depth break down of what someone can do to start organizing. Let's say, I know you recommend Evernote. So why don't we go in Evernote and kind of give a picture of what Evernote looks like, what your Evernote looks like, so somebody could kind of get an idea of what they could turn their Evernote into. That would allow them to start capturing some of those snippets. Tiago Forte: Sure. Okay. Great. So a couple things first. When I say knowledge management system, which I also call your second brain, it's different from just having a bunch of files on a computer. Right? I think most of us have a PDF or a word files or text files or notes in our Notes app on our phone but to be a real second brain, it has to be really readily available. Has to be something that you can just pop open, drop something in there, really easily, really frictionlessly. Then of course access it, just as easily and just as quickly when you need it. And that's why I recommend this category of notes apps. Right? If you think about something like Evernote, and there are others too, it's not that that's the only program. There is Microsoft One Note, Bear, Notion. There is a whole category now. But when you open up one of these programs, you know it's not like you're seeing just a bunch of icons where you have to then click on something and then open it. Then close it and double click on something else. You kind of have to look one at a time. With the Notes app, you just have a list of essentially text files. You can also have images and attachments but it's primarily text. And you can just kind of, you can kind of just poke around and it's funny. I found poking around is one of the most useful ways of kind of reviewing and revitalizing your knowledge management system. I actually don't recommend these really, there are really rigorous methods like space repetition where you like, you review your notes on a very strict schedule and you spend this many minutes per day, this many hours per week reviewing your knowledge. I don't know about ... maybe in large companies or universities they have that kind of time. As an entrepreneur, I do not have time to be reviewing knowledge just for the sake of reviewing knowledge. So I really recommend just combining the ... so the way to do it is to combine your knowledge management system with your product management system. Okay? This will work really well for your audience I think. Most of them I would guess do not use any kind of heavy project management system. They probably have a centralized Basecamp or Zoho or Asana or one of these kind of centralized task management systems. But they are probably not doing big Gantt charts or big heavy critical path diagrams and all these things. Really project planning for small businesses comes out to text documents usually. You know? Like what are you doing when you're planning a project? You're making a list. Making a maybe like a ... some sort of list right, where you're writing something out or you're making a brief. It's just different ways of using text. So when you bring all that stuff, all that activity, knowledge management and product management into one place, such as a Notes app, you start to see all these connections. For example, so you have your micro projects, right? Which means you have 10, 20, 30 of these small projects. You start to see that they have things in common. Right? So oh we're working on fixing this little part, this bug on the website over here, but we also have a bug on a different say website we're managing over here and they are related. Or oh we're pitching a client on this brief, but we also have two other clients that we're going to have to pitch. Why don't we create like a template and have that template be a common client pitch template. So I know that was a lot of things. So basically the idea is to think of your work, not just as doing things. You go through your day and you do things. You create things. You send emails. You have phone calls. But just consider that in every one of those activities, you're producing knowledge. Like there is actually something of durable value being created in every one of those activities. And I know this is a different way of thinking. Usually we only think about the result and the outcome. But think about all the little things that you create. Meeting agendas. Meeting notes. You create templates. You create checklists. You create diagrams. You slip little screenshots of web pages that you like. You take some copy from a marketing page that you like. All these little snippets have value. So, since you're doing that work anyway, as part of your projects. I am trying to get people to just save them. Take that extra moment, either right at that moment or at the end of the day or the week, and just dump it all into a Notes app where you're going to recycle it and revisit it and eventually start reusing that stuff. Which by the way is ultimate productivity. If you really want to increase your productivity, more than working faster or working more efficiently, if you reuse a piece of work from the past, you just double the productivity of that work, right? If you reuse a template again and again and again, the work of creating that template was hugely productive, because you're leveraging your effort multiple times. So those were a few ideas from the world of knowledge management. Andrew Foxwell: For me hearing this, it's kind of crazy because I've never really thought about a system for managing knowledge, where it's all the stuff that you want to see and all the stuff that you get derailed with. Like an article you want to dive into but you don't do that and I think that I mean a lot of the things that I do is based on time blocking and actually just blocking out time to be able to do something, not a complicated concept. Probably a lot of people do that. And, but one thing I was missing was the ability to actually plan my time blocking. Andrew Foxwell: So this is what you're saying which is to be able to put all these things in one place but then make sure that you're reserving time to go through them. And reserving time to delegate them or to put them in a place or to make them actionable right. I heard you say before on another podcast, don't attempt to organize by what they mean, organize by how actionable they are. Which as a stand alone concept on their own, it's crazy useful I think. So I think that's helpful. One question that I have that's related to the knowledge management and into a content management is a lot of organizations use and utilize Slack now as the main way of looking at it and they will compliment that with an Asana. If you were set something up for an ideal client, it involves Evernote right? I would assume. Or something like that, that involves tagging, because I know that's an important concept you've mentioned before. So can you talk about the tactical implementation of that and what you see commonly in Silicon Valley and how that relates to some of the tools you like the best? Tiago Forte: Yes. Great. So here is what I see. I work with a lot of people and teams that use a wide range of productivity apps. But what I would say, excuse me, is that any piece of software that is designed for taking action, where the focus is action, it's producing a result. It's producing an outcome. It's executing, which is most of them, as they should be. Obviously, almost any productivity app if it's good will be focused on helping you get things done. But the weird thing is that the more it's focused on action, the less useful it is for knowledge. And the reason for that is, knowledge is kind of this, you don't really know what parts of say a knowledge base is going to be useful. It's just a lot of data. You have a lot of ideas. A lot of theories. A lot of text you've copied. A lot of content. A lot of pictures, images, attachments. It's a lot of stuff. It does get voluminous. The last thing you want to do is get all of that content and dump it into your task management or project management tool. And so that's what I see with Asana and Slack. You know Slack claims to be your knowledge base because oh you can search your unlimited history of Slack conversations if you have the paid version. I don't think I've ever met someone that really went back and searched that archive, besides maybe like finding a phone number or something. Or something very small. I think the idea that your ... that your communication or your tasks for that matter are some sort of knowledge base, is just not true. That's not what knowledge it. It doesn't give me any value seeing the tasks that I completed a year ago or even a month ago. Those are finished. Andrew Foxwell: Right. There is no ranking to them. I mean really either. You're like this is ... I have no idea if I use the word sustainability, like in one conversation versus another. Tiago Forte: Right. Exactly. Communication and task execution, it's supposed to be succinct. Good communication. Good execution. It sparks. It's small. But knowledge is sometimes luminous. If you're learning marketing, you have a lot of different kinds of data to track. So what I say is to have a very clear separation between your knowledge management app, whatever that is, if it's a notes app or something else. And the apps that you use to actually take action. And the cool thing is with software, there is interconnections. There's now a very cool integration between Slack and Evernote. There's very good integration between Microsoft One Note and the whole suite of Microsoft projects. So it's not like you have to go and build this special monument apart from everything else. No. It's integrated and connected. There just is a little bit of separation. Andrew Foxwell: Super interesting and something that I'm going to take and get started with, but I know we want to wrap up here. We are kind of getting towards the end of our time. One of the things I just kind of wanted to ... maybe just a rapid-fire question here, because we get a lot of positive feedback on stuff like this. What are some very easy wins that people can take this week to kind of make themselves more productive? I know this more tactical, less paradigm-shifting, but is there anything you have found that you could kind of recommend for some really easy wins? Tiago Forte: Yes. Absolutely. So here is something you can try as a sort of trial. Some of the pretty, I know heady ideas that I've been talking about here, which is thinking about your sessions. Okay? A work session is just a discrete, it's a set amount of time where you sit or possibly stand to get something done. It could be 15 minutes to a few hours. A work session is a work session. And what I say is try, so beyond the usual stuff, turning off notifications and focusing on one thing and the usual productivity tips, see if you can try to end each and every work session with some kind of tangible deliverable. When I say deliverable, I know that's usually associated with consulting. Like something you send to a client. What I mean is just some sort of tangible thing that you made. Whether it's an outline or a diagram or a brief or a paragraph of text. Something that you made. And just right as you end the work session, try to end with something tangible. Then as you step away from the work session to go do something else, just send it to someone, right? So right before you stand up to go take lunch or whatever, send it to a colleague. Put it in the staff channel on Slack. Or what I do often is share it on social media. That takes an extra level of boldness. Just share it. Because what will happen is instead of just walking away from whatever you were working on and you know the ideas in your head, they kind of dissolve and kind of fade away. You send something out into the world where the next time you sit down to work, you'll have feedback, right? Someone will have sent you something. Someone will have interacted on social media. And so the next time you sit down to work, instead of just kind of picking up where you left off the last time, trying to remember what you were doing, you will have actually new information. You will have new data. So what we're talking about here is basically the structure of your work sessions. Yes, you know sprint as fast as you can but when it comes to timing, see if you can time the end of the work session to finish something tangible that you can then share. Austin Brawner: I like it a lot. Andrew Foxwell: I do too. It's huge. It's like going back to your concept of people seeing small wins and completing those small tasks completely changes the mindset. So it's similar in that regard. Well it's been a pleasure chatting with you and we're really glad to have you on. Tiago Forte: Thank you so much both of you. Andrew, Austin it's been a pleasure. You ... just talking through these ideas gave me some renewed clarity for my book writing which I'm going to get to now.